Don’t feel alone if you listen to this obscure West African disc and think, “What the hell?” It really is one of those records. A group of rural female singers wailing along with a group of urban musicians in a studio already creates an odd juxtaposition, but it’s pushed over the top with the addition of a keyboardist on an electric, monophonic organ, who, for whatever reason, occasionally quotes the “Tuileries” movement of Mussorgsky’s Pictures at an Exhibition. I included a piece from Cameroon on Opika Pende that has a similar, if a bit more chaotic feel (Onana Mbosa Isidore’s “Kurungu”), and I’d always wondered if I’d ever hear another disc like it. It didn’t take long. This brazen, almost anachronistic blend of traditional, classical, and modern music, seems to have occasionally crept out of the studios of Opika, one of the most successful independent Congolese record labels and one of the primary sources of the birth of Afro-pop. It almost seems as if it was a deliberate attempt on their part to “modernize” some traditional music. If two records like this exist, then surely there are more. The Kinsahsa-based Opika issued approximately 2,000 individual 78s from its inception in the late 1940s until the company folded in 1957. I’ve written about Opika in the past both in print and on the site, and that the company was started by Greek Jews from Rhodes, the Benetar brothers, Gabriel and Joseph. Their main competitor in Kinshasa, the Ngoma label, was also Greek-run and issued a similar amount of discs, before folding not long after Opika. But during their years of activity, it was a furious race to press more and more popular records – the rumbas, the cha-cha-chas, the guitar bands, and the artists who would become legends, like Wendo and Nico. But that’s not solely what these labels recorded. What has been left out of the books and the many fine reissues that feature 78s from the Congo are the hundreds of traditional recordings these labels made (or, in this case, perhaps “semi-traditional”), as well as the hundreds of recordings they made outside Kinshasa. Their history has not yet been written – or much heard. Ngoma, for example, chose to record many traditional cultures around Congo, in dozens of local languages. These sound like rough and raw field recordings for the most part, and they did the same in Cameroon as well. Opika, while they did not record nearly as much traditional music as Ngoma, had several West African distributors. From the early 50s, they began recording both top high-life bands in Ghana, such as E.K.’s Band, and issuing them with a new colorful label. Also, likely due to improved train transportation, economic competition, and the portability of tape machines, Opika began recording artists from Côte d’Ivoire and then-Upper Volta, both regions that had been totally ignored by record labels until the early 1950s. This disc certainly falls into the latter category. Recorded circa 1954 for Opika’s Côte d’Ivoire/”Haute Volta” distributor C.I.C.A. 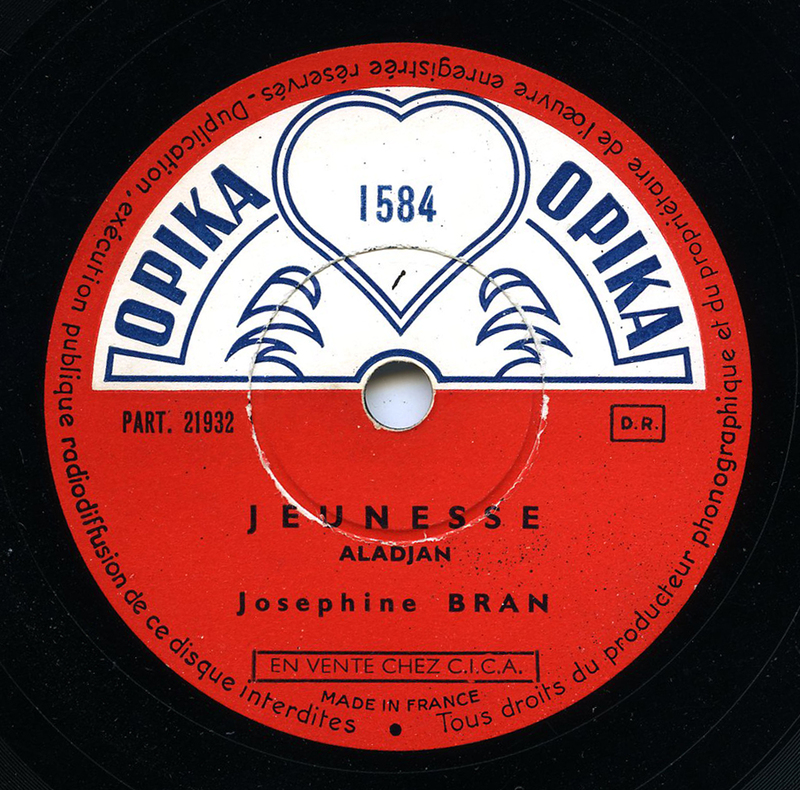 (I believe the short form of a French concern known as the “Compagnie Industrielle de la Côte d’Afrique”), this strange gem by Ms Josephine Bran is in the Alladian language, also known as Alladyan, Allagian, or on this disc as Aladjan. It’s spoken in the southern part of Côte d’Ivoire in about 21 villages today, with a total of about 23,000 speakers. Whether or not it’s an attempt to blend traditional music with a modern backing group in the style found on most uptown Congolese rumbas, or whether this amalgamation found an audience, is hard to say. And who is that playing the Solovox organ, which also turns up on a lot of popular Congolese recordings of the day? According to Congolese music expert Vincent Kenis, it’s Gilbert Warnant, the Belgian recording engineer and talent scout for Opika for most of the 1950s. Vincent also mentioned that the Solovox segment in the middle of the piece is in fact the French children’s song “Nous n’irons plus au bois” (English: “We’ll go to the woods no more”). Did they ever think that someone 60 years later would hear their little secrets? Did the singers have any idea? That is, in part, what’s exciting about it – it’s just different, and opens up many questions.